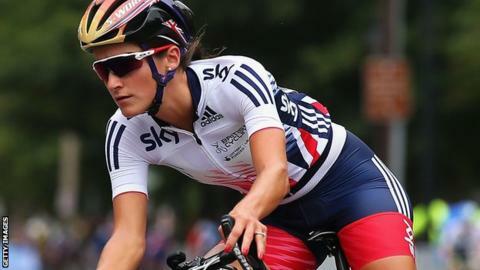 British world champion Lizzie Armitstead will race for the most lucrative prize in women's cycling at next month's Tour de Yorkshire. The winner gets £15,000 - more than the winner of the men's race and £14,000 more than 2015 champion Louise Mahe. The 135km ride from Otley to Doncaster takes place on Saturday, 30 April, with the second stage of the men's three-day race starting later on the same course. It is Otley-born Armitstead's first race as world champion in the UK. "We're trying to seismically change the sport," said Sir Gary Verity, chief executive of organisers Welcome To Yorkshire. "If you won all three stages of the men's race and you took the general classification money as well, you would still be 40% worse off than the winner of the women's race. So that's a big difference." Armitstead, who will be riding for GB because her usual team, Boels Dolmans, is not competing, said "It's an absolute dream to be starting in my hometown." The 27-year-old is also the reigning British and Commonwealth champion and has won her last five races, including that superb victory at the World Road Championships in the US last September. Armitstead skipped last year's inaugural Tour de Yorkshire as it clashed with a higher-ranked event in Luxembourg but tourism agency Welcome to Yorkshire have worked hard to boost its profile. It is now classified in the category just below the 17 races on the new International Cycling Union (UCI) Women's WorldTour. With Leeds-based supermarket Asda as a sponsor, the £50,000 prize fund is comparable to the biggest one-day races on the men's circuit. French sprinter Arnaud Demare's prize for winning Milan-San Remo, the first big classic of the men's season, was £15,600, which is the same as will be available at the next major one-day race, the Tour of Flanders. The winner of the Women's Tour of Flanders, however, will get £957. The Yorkshire prize pot is also almost double what is on offer at the premier race for female professionals in this country, the five-day Women's Tour in June. Cycling has a far worse record for gender inequality than tennis - the game currently dominating the headlines for sexism in sport - and leading female riders have been calling for better events and more exposure for years. When asked whether she thought cycling was sexist, Armitstead said: "Well, yeah, traditionally, yes. But it is improving. "Our sport is the younger side of the sport than the men's and there is a long way to go, but it is getting there. "There are different aspects that need improving. Media coverage, for a start, needs to improve. People need to be able to watch me win races rather than just read about them on Twitter. "It's getting there but, as I say, it needs a lot of things to happen." Coverage of both races at the Tour de Yorkshire will be shown live on ITV4 and Eurosport. The Tour de Yorkshire is part of the legacy of the region's successful hosting of the Grand Depart of the 2014 Tour de France. Norway's Lars Petter Nordhaug won the men's version in 2015, with Britain's Mahe the female champion. Will Britain dominate cycling in Rio? Read more on Rio 2016: Can Britain dominate cycling yet again?